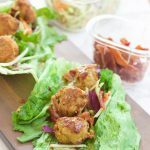 This pumpkin sage meatball lettuce wrap + hot bacon vinaigrette recipe is juicy and savory, with fresh crisp vegetables and moist round meatballs drizzled in a warm bacon dressing with a touch of heat! With Turkey Day a little over a week away It’s thanksgiving game time y’all! And with that comes knifes clapping down on cutting boards during food prepping, that extra trip to the grocery store because you forgot star anise, and those dang roasted thanksgiving turkey jitters. But it’ll all turn out just fine. I always go with my super simple roast turkey that I walked you through and held your hand with just the other day. if you need to check it out to tame those turkey nerves of yours again, do so. I’ll be here waiting for ya. But besides all of that hustle of the holiday, there’s all a whole lot of LEFTOVERS to figure out too! Oh my goodness do I love a good holiday leftover meal (like my fav Christmas ham and cheese hot pocket leftovers!). And I did promise y’all a few days ago that I’d be sharing some of my best thanksgiving turkey leftover ideas with y’all and so today I am fulfilling that promise with one of the best leftover turkey ideas of all time. 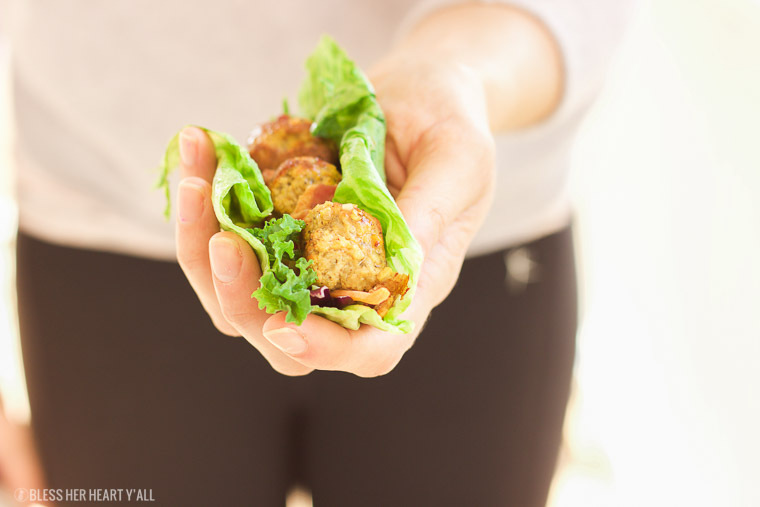 Please welcome to the stage, the Pumpkin Sage Meatball Lettuce Wrap + Hot Bacon Vinaigrette. Smack your lips. Smack your lips. 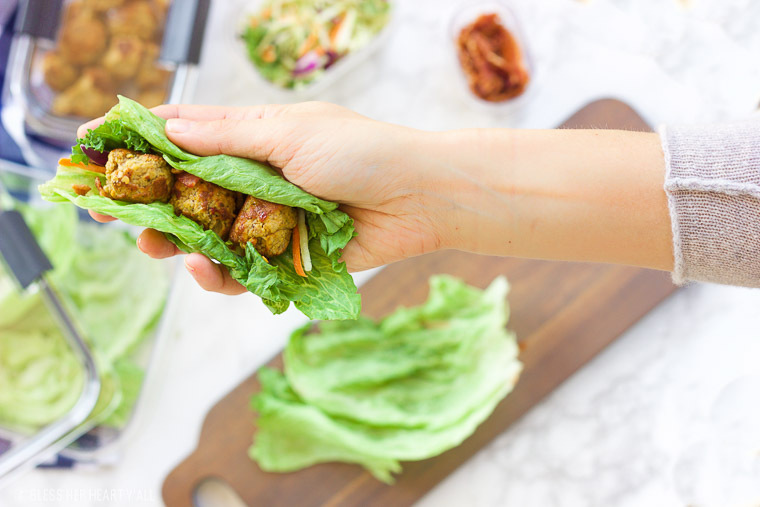 Not only is this meatball lettuce wrap amazingly flavor-packed with its pumpkin, sage, and bacon hints, but it’s the perfect day-after-Thanksgiving meal to serve to guests. 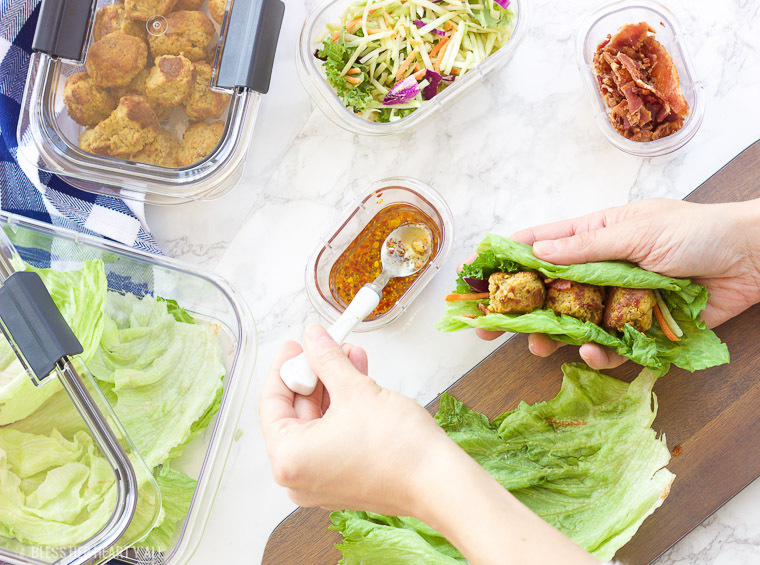 All of the wrap’s ingredients can be made ahead of time, kept in the fridge in Rubbermaid Brilliance until meal time, and then quickly created and customized for each guest in a matter of seconds when it’s time to eat. Here, let me show you how easy and fun this can be. Oh yeah, and how delicious and juicy. And warm and savory. And crisp and crunchy. Let’s get the prep work out of the way so you can spend more time with those you’re entertaining. First you’ll need to make your baked pumpkin sage meatballs which should take you a total of 20-25 minutes. Shoot… while your meatballs are baking you can make your hot bacon vinaigrette and clean and shred your veggies too. 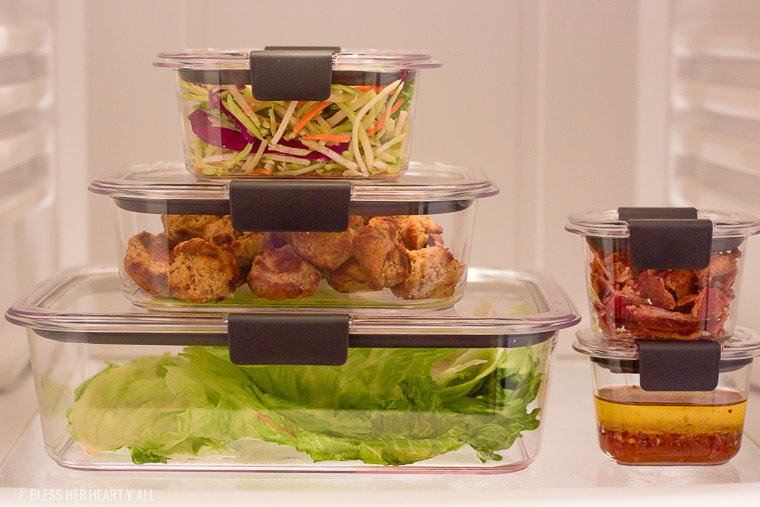 After you’ve got your cooked meatballs, hot bacon vinaigrette, cleaned lettuce leaves, and shredded seasonal veggies together, simply add them to the perfect fitting Rubbermaid Brilliance container. Once the leak proof covers are sealed just stack them together in your fridge. If your fridge is anything like mine during the holiday season (#PackedToTheBrim) then I would also consider labeling the containers so that late night munchers don’t accidentally munch too much of your lettuce wrap ingredients away. I recommend using a dry erase marker to label your containers. The dry erase marker is easy to erase away with a paper towel and won’t leave a residue on your containers. 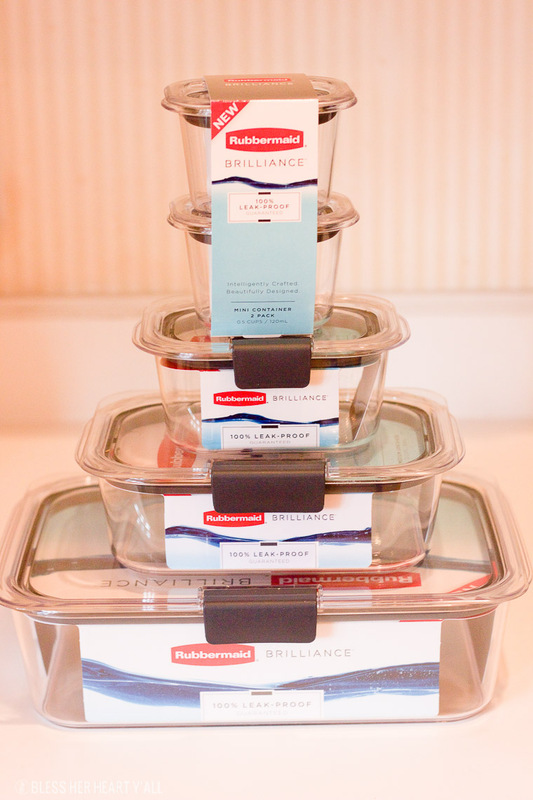 On a side note, these Rubbermaid Brilliance containers seriously help my OCD hubby Alex and I stay much more organized. The Brilliance line is 100% guaranteed leak-proof airtight seal (that you can even hear!) and is also stain and odor resistant, features 360o crystal clear visibility, enhanced durability, is space efficient and stackable, and splatter resistant with microwave vent flaps. When you are ready to eat, simply remove the containers from the fridge, reheat the hot bacon vinaigrette in the Rubbermaid container (they’re microwave safe) as well as the meatballs (microwave for 10 second intervals until they reach your desired heated temp) and place serving spoons in the dishes to help with the layers of greatness! Preheat your oven to 400*F. Lightly coat a mini muffin tin with cooking spray and set aside. Combine all of the meatball ingredients together with your hands and roll into 1" balls. Place each ball in one of the mini muffin tin holes. Bake for 10 minutes, carefully flip with tongs, and bake for another 10 minutes, or until golden born on the outside. Remove and let cool. While the meatballs are baking, cook your bacon and make your vinaigrette by combining all of your vinaigrette ingredients together and mixing well. When it's time to eat, shred the leftover seasonal vegetables from Thanksgiving dinner, and sprinkle them inside lettuce cups, followed by 3-4 pumpkin sage meatballs, sprinkle on bacon crumbles, and lastly drizzle over the hot bacon vinaigrette. Enjoy! Here is a 10% off coupon when you use your Cartwheel app at Target (10% Off Small Rubbermaid Brilliance Food Storage Container, 11/13/2016 – 11/19/2016) to purchase your Rubbermaid Brilliance containers. That should help a bit! 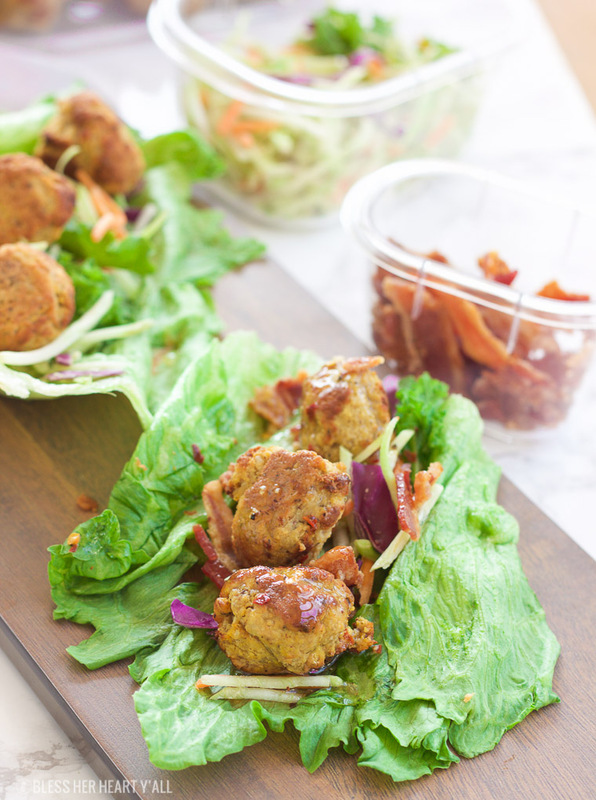 Have fun making and storing your pumpkin sage meatball lettuce wraps and enjoy that hot bacon vinaigrette! Mmmmmmmmm y’all! Question: if using ground turkey would you suggest partially cooking before hand, or mix with ingredients raw? Great question Jean! I would cook the ground turkey meat before starting the recipe and then incorporating it into the recipe just like the “leftover turkey meat” is used. Thanks for asking! This meal has all the flavor! Yum. Oh, yum! Putting this in my gluten-free main dish board. This looks so good! I love savory pumpkin dishes!